Interested in taking part in Walk In Her Shoes but have questions before taking your first step? This handy collection of frequently asked questions should help. If you have a question that we haven’t answered here, please contact us and we’ll be happy to help. Most of our supporters will take part from 6-12th May 2019, but you can take part at any time of year. Choose when you'll walk, and invite your friends to join you. Complete your online registration. This just takes a minute! Set up your JustGiving page (which you can do as part of your online registration process) and check out these handy tips for gaining sponsorship. We’ll send you everything you need to take part. Walk 10k steps a day from 6-12th May (or your week of choice) and raise your £100 sponsorship. How far is 10k steps? 10k steps is about 8 km or 5 miles. The NHS says that walking this amount each day will significantly improve your health. Most people should have no problem walking 10k steps a day, but it may require some planning. If you already walk a lot, why not choose a greater number of steps for a bigger challenge? Either way, see our walking tips for some great ways to reach your target. What if I can’t walk 10k steps per day? Don't worry! 10k steps is only a suggestion, as this is roughly the distance that women and girls in developing countries walk each day to collect water. If you feel this distance is too challenging, then simply choose a distance that you're more comfortable with. How do I keep track of how many steps I’ve walked? When registering for Walk In Her Shoes, you can choose the full postal pack for £10, which will include a pedometer to track your steps each day. Alternatively, you could download one of the many great pedometer apps for Android and iPhone. How will I manage to walk 10k steps a day? Most people should have no problem walking 10k steps a day, but it may require some planning. The easiest way is to fit it into your daily life, such as walking to work instead of catching the bus, taking the stairs instead of the lift, or walking your friend’s dog. Have a look at our walking tips for tips on how to achieve your steps. Registrations for Walk In Her Shoes are open all year, and you can take on the challenge whenever you like. If you want the best possible walking experience, we would recommend signing up in time to join the majority of our supporters on 16 April 2018. How much money do I have to raise to take part? We ask each participant to aim to raise a minimum of £100. If you can raise more, that’s fantastic! Your fundraising could allow CARE to support one family in the construction of a water point in their community, relieving women and girls of their daily walk for water, and giving the gift of time for work or school. If you need another reason to get fundraising, we've got some great prizes on offer for top fundraisers! Check out our fundraising ideas for more inspiration and ideas to get you started. Gift aid is a scheme designed by the government as a great bonus for charities where it can be claimed, but it also not guaranteed, therefore Gift Aid is not included in the minimum sponsorship for any CARE fundraising event. Is there a registration fee to take part? Register for £5 and receive your Walk In Her Shoes t-shirt by post. We'll then send your fundraising pack by email. Register for £10 and receive our full mail pack, including your T-shirt, pedometer and printed fundraising pack. Whichever option you chose, you’ll be fully supported from start to finish by our fantastic Walk In Her Shoes team. I've never fundraised before. How can I raise money? The easiest way to raise your £100 is to gain sponsorship from your friends, family and colleagues for the 10,000 step challenge. The best way to get started is to spread the word online - after you've set up your JustGiving page, share your link with everyone you know by email, Facebook, Twitter, LinkedIn, and whatever other social media platforms take your fancy! Let your supporters know why taking part is important to you and why you'd like them to donate. You can also share some of our great fundraising resources on social media as well. What fundraising resources are available? We'll keep you up to date by email with loads of fundraising tips and advice, and we've also put together a list of helpful fundraising ideas so you can smash your target. We have some great fundraising resources to share online, and if there's anything else you need help with, you can always contact the Walk In Her Shoes team by email as well! How do I get a sponsorship form? After you've registered, we'll send you a sponsorship form to print at home by email, and if you've opted for the £10 registration fee, we'll also send you one in the post. If you've been overwhelmed by the support of your friends and family and need more, just give us a call on 020 7091 6100. How can I pay in the funds I raise? I don't want to take part, but I would like to donate. How do I do this? Even if you don't feel you can take part in Walk In Her Shoes, we would be very grateful for your support. The best way to make a donation is over the phone with a debit or credit card by calling us on 020 7091 6100. 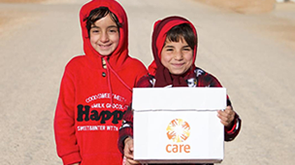 Alternatively, you can send us a cheque made payable to CARE International UK. Please enclose a note with your name, contact details, and referencing Walk In Her Shoes. Cheques can be sent to us at: Walk In Her Shoes, CARE International UK, 89 Albert Embankment, London, SE1 7TP. Many women and girls in developing countries have to walk miles every day to fetch water for their families. These gruelling daily treks mean they may not have time to reach their full potential in life. The money you raise can allow CARE to work with local communities in the poorest countries to build clean and safe water sources closer to home, like wells, boreholes and standing taps. This will not only provide poor communities with clean water that is safe to drink, but will also relieve women and girls of their daily trek for water, and allow them time for work or school. With an education or time to earn an income, they have a chance to fulfil their potential and step out of poverty. Read more about how your support can make a difference. Walk In Her Shoes is open to all ages and abilities. However, please check with your doctor prior to the walk if you have any medical conditions that would endanger you when taking part. If you're under 18 and would like to take part, we would recommend registering to take part with a parent or guardian as well. Can I register as part of a larger group? The bigger the group, the bigger the difference we can make together! Everybody is welcome in taking part in Walk In Her Shoes, from church groups to Rotary Clubs, Girl Guides to companies, etc. Each member of your group needs to sign up online individually and mention the name of your group in the registration form. When do I get my welcome pack? You will receive a welcome email as soon as you complete your registration, which will include a digital fundraising guide. Our fundraising resources will also provide you with some great support, as well as the ongoing emails that you will receive leading up to May 2019. If you choose the £5 registration option, your Walk In Her Shoes T-shirt will be with you at least two weeks before your walk. Please make sure you specify when you're planning to walk so we can send your T-shirt in time. Likewise, if you choose the £10 registration option, your full mail pack will also be with you at least two weeks before your walk. If you think your pack may have been lost in the post, please contact the team to arrange a replacement. What if my T-shirt doesn't fit? If your T-shirt arrives and doesn't fit correctly, please feel free to contact the Walk In Her Shoes team to arrange a replacement on 020 7091 6100 or by email. Please let us know what size would be better suited, and we'll happily send a new one. We ask that you send the unsuitable T-shirt back to us. This means that we can send the T-shirt to another participant, saving CARE money, and making Walk In Her Shoes have more impact. If you live outside the UK and would like to take part in Walk In Her Shoes with CARE International UK, we would be very happy to have you on board. We would recommend registering for £5 but unfortunately we can't send T-shirts internationally without an additional shipping payment. Please contact us by email after registering to arrange an additional flat-rate shipping payment of £5. We'll then provide you with the same experience and support that all of our fantastic Walk In Her Shoes participants in the UK will receive! How will CARE use my information?